In December l ast year Venezuela’s political right wing gained a majority in the National Assembly, defeating the country’s socialist PSUV party, which for 17 years has worked unremittingly in the interests of the most vulnerable sectors of society. 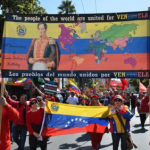 Supported by the US and the neo-liberal block, this right-wing resurgence has destabilised the country and provoked dismay among the left leaning countries of Latin America, which have formed a new Parliamentary Network to confront the threat of neo-liberalism in the region. To make matters worse, the collapse of global oil prices and an unprecedented rise in inflation have adversely affected the economy, and President Maduro has been forced to declare a state of economic emergency. The National Assembly attempted unsuccessfully to block this measure, and its leader Henry Ramos Allup has now called for President Maduro to be removed from office. Dr Francisco Dominguez, Head of the Centre for Brazilian and Latin American Studies at Middlesex University, and Secretary of the Venezuelan Solidarity Campaign, will discuss this extremely grave situation with us.